The myth that the Labour party are profligate with public money, and that the Tories go around cleaning up their messes is one of the most pervasive political narratives in the UK. It is thanks to this myth that even after four years of breathtaking economic incompetence from George Osborne, the Tories are still considered more trustworthy on economic issues than Labour by the majority of the public. Regular readers will know that I am no fan of the New Labour party, however I'm completely sick of listening to delusional Tory tribalists mindlessly churning out their counter-factual "always cleaning up Labour's messes" narratives in order to defend George Osborne's record of economic incompetence, exactly as they have been programmed to do by the mainstream media. It's not just delusional Tory supporters who repeat this myth either, even high profile Tories love to churn out counter-factual rubbish and outright lies. In this article I'll first provide evidence to fatally undermine the Tory narrative that they are the party of economic competence in the opening sentence of this quote, before then critiquing the rest of the quote in order to demonstrate George Osborne's appalling economic incompetence. A quick look at the actual evidence reveals that only two Labour governments have ever left office leaving the national debt higher than it was when they came to power, all of the others have lowered the national debt as a percentage of GDP. On the two occasions that Labour oversaw increases in the national debt there were the mitigating circumstances of huge global financial crises. The Ramsay MacDonald government of 1929-31 coincided with the Wall Street Crash (they left a 12% increase in the debt to GDP ratio), and the Blair-Brown government of 1997-2010 coincided with the 2008 financial sector insolvency crisis (an 11% increase). The other Labour governments all reduced the scale of the national debt, Clement Attlee's 1945-51 government reduced the national debt by 40% of GDP despite having to rebuild the UK economy from the ruins of the Second World War. Harold Wilson's 1964-70 government reduced the national debt by 27% of GDP and even the Wilson-Callaghan government of 1974-79 managed to reduce the debt by 4% of GDP. The majority of Labour governments have ended up reducing the national debt, and the two that didn't coincided with the biggest global financial crisis of the 20th Century and the biggest global financial crisis so far in the 21st Century. In order to put this "cleaning up Labour's mess" narrative to the test, it is useful to look at George Osborne's own record as Chancellor of the Exchequer. In his first 3 years as Chancellor George Osborne managed to add more to the national debt than the supposedly "profligate and irresponsible" Labour party did in the 13 preceding years. In fact, in just 4 years George Osborne has increased the national debt in real terms more than every Labour party chancellor in history combined! 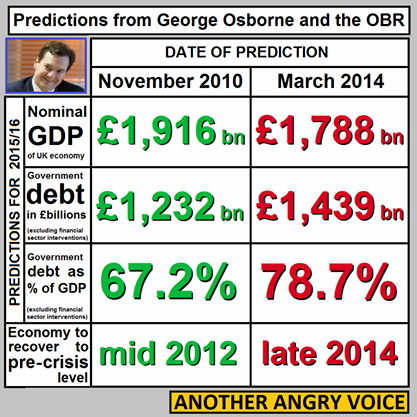 By George Osborne's own estimates, the national debt will have grown by 26% of GDP between 2010 and 2015. In the last 200 years of economic history there have only been three periods of debt accumulation worse than George Osborne's tenure as Chancellor of the Exchequer: The First World War (+110% of GDP), the Second World War (+100% of GDP) and the tenure of Tory Chancellor Nicholas Vansittart 1812-1823 (+64% of GDP). Not only has George Osborne added more to the national debt than any Labour government in history, he has also spectacularly missed all of his headline economic predictions. By the time the current parliament ends in 2015 Osborne will have borrowed £207 billion more than he claimed he was going to in 2010 in order to make the UK economy £128 billion smaller than he said it was going to be. He has also had the UK stripped of their AAA rating by the Credit Rating Agencies for the first time since the 1970s and overseen the longest sustained decline in wages in economic history. Returning to George Osborne's 2008 quote we can see just how much of a failure he has been in his own terms. "We will have to establish a credible framework for bringing the public finances under control. That means creating a target of a balanced current budget and falling debt at the end of the forecast period". the Tories now admit that George Osborne's promises of a balanced budget and falling debt by the end of the 2010-2015 parliament are now impossible pipe dreams. As for his supposedly "independent" Office for Budget Responsibility, George Osborne's pet economics quango have provided spectacularly inaccurate economic forecasts over and again. They willingly rubber stamped all of George Osborne's ludicrously over-optimistic projections based on his economic fairy stories about how the economy could be saved by drastically cutting expenditure across the board, without bothering to even evaluate the projected returns on investment on the infrastructure projects and services to be culled. One of the first steps for the the new government in 2015 should be to abolish the OBR, or at least rename it more accurately as the Office for Budget Recklessness. The remarkable thing is that despite George Osborne's abysmal track record of failure, Tory tribalists still wheel out the "always cleaning up Labour's mess" narrative as if increasing the national debt by 11% of GDP in 13 years (as New Labour did) is somehow significantly worse than George Osborne's record of increasing the national debt by 26% in just 5 years. What is even worse is that the mindless Tory tribalists now have another grotesquely counter-factual narrative about "the economic recovery" to blether on about. They seem intent on talking up the fact that the UK has now recovered to the pre-crisis economic peak, despite the fact that the UK was the last major western economy to do so, and that this so called recovery shows that the UK economy has grown by an aggregate 0% over the last seven years! The reality is that the GDP of the UK is now pretty much exactly the same as it was just before the economic crisis, however the economy has been massively rebalanced, with a huge increase in the share of the wealth in the hands of the top 0.5%, and a large reduction in the living standards of the majority due to wage repression, severe cuts in in-work benefits, rampant inflation in the costs of transport, fuel, housing and food, and George Osborne's hike in VAT. The majority of us are significantly worse off after four years of ideological "Osbornomics", the national debt is much higher than Osborne claimed it would be, and the economy is much smaller than he projected it would be. 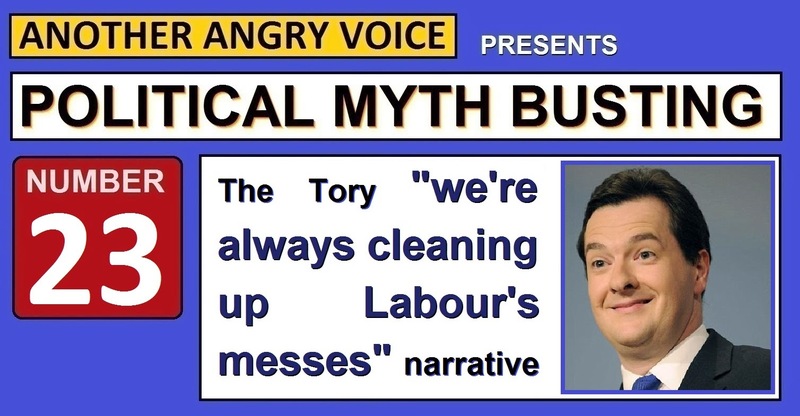 The sad thing is that there will be just as many delusional Tory tribalists hawking their absurd "economic recovery" narratives they've rote learned from the mainstream media as there are credulous Tory supporters invoking the ludicrous "always cleaning up Labour's mess" fairy stories. The Tory "cleaning up Labour's mess" narrative just doesn't stand up to the evidence, however, when it comes to Tory politics, facts and evidence are much less important than the creation of simplistic narratives to feed to a dumbed-down and credulous public. It doesn't matter what the evidence says, because the typical political tribalist isn't remotely interested in searching out the evidence and fact-checking things. All they require is a nice simplistic narrative that confirms their prejudices, and allows them to go around thinking that they are an expert due to their complete understanding of their simplistic explanation, despite the fact that they know next to nothing about the much more complex reality. Who is to blame for the 2008 financial sector insolvency crisis? According to the IPPR Future of England survey 2014, I'm in a small minority of Englishmen who support Scottish independence. Just 19% of respondents to the Future of England survey were in favour, which makes me one of the few English people who support the idea of greater autonomy and increased political accountability north of the border. The findings of this survey paint an ugly picture of England as a land filled with bitter, resentful and vindictive people, seething with anger at the audacity of the Scots for even daring consider an escape from the misrule of the Westminster establishment. What is much more concerning than the fact that the majority of the English oppose Scottish independence, is the fact that a clear majority believe that the Westminster establishment should punish the people of Scotland with huge funding cuts should they vote against independence in the referendum. The mainstream media has described this attitude as "the English" seeking a "heavy price" for the independence referendum. The motivation behind this common English desire to have Scottish funding cut by some £4 billion to bring per capita spending down to the UK average, is the pervasive media narrative that the Scottish are a bunch of "subsidy junkies". A brief look at the actual facts reveals that Scotland does indeed benefit from slightly higher per capita government spending than the UK average, however Scotland also has a much higher per capita GDP than the rest of the UK, thanks largely to the revenues from Scottish oil and gas. Once the proceeds from oil and gas are added into the equation it turns out that tax revenues in Scotland are nearly 20% higher than the UK average which would make slightly higher public spending seem pretty fair. Once the supply of North Sea oil begins to dwindle, Scotland also has huge renewable energy potential, including some 25% of EU offshore wind potential, 25% of EU tidal potential, and 10% of EU hydroelectric potential. These vast supplies of actual and potential energy reserves make Scotland a very wealthy country indeed, however a great swathe of the English public seem to believe that the Scottish people should be denied the benefits of all of this Scottish energy wealth so that it can be distributed to the people of England instead. One of the most absurd things about this English bitterness towards Scotland is the way that they completely overlook the fact that government spending in London is much higher than the levels of public spending in Scotland that the mainstream media have whipped them up into a frenzy of bitterness and jealousy about. The disparity in public spending between London and the rest of England is so enormous that more than half of England's infrastructure budget is spent just in London and the South East. To put this into perspective, the annual investment in transport infrastructure in the North East of England is just £246 per person, while the annual amount in London is £4,895! You'd have to be a particularly one-eyed Englishman to allow the mainstream media to whip you up into a frenzy over the fact that average public spending in Scotland is slightly higher than the average for England, without realising, or caring, that vastly more public money is poured into London than anywhere else, including Scotland (and that's without even adding the £1.5 trillion in public money that was sunk into the City of London financial sector to save the bankers from the consequences of their own reckless gambling into the equation). When the majority of English people demand that the level of Scotland's per capita government spending is reduced to the UK average, what they are actually demanding is that the Scottish public be denied the economic benefits of their own abundance of natural resources, so that the benefits can be redistributed to England instead. In order to adopt this absurd "It's not fair that Scotland gets more" position, they have to completely ignore the elephant in the room, which is the vastly bigger disparity that exists between government spending in London, compared with the rest of England. What makes this common English "punish them if they vote no" attitude so much worse is the fact that the majority of respondents to the IPPR survey also want to see the Westminster establishment use its powers to obstruct an independent Scotland by trying to force them out of the EU and other international institutions, and by attempting to prevent them from using the pound (even though that would be impossible because the pound is a fully tradeable international currency). This "punish them whatever they decide to do" stance actually makes a very strong argument in favour of Scottish independence. 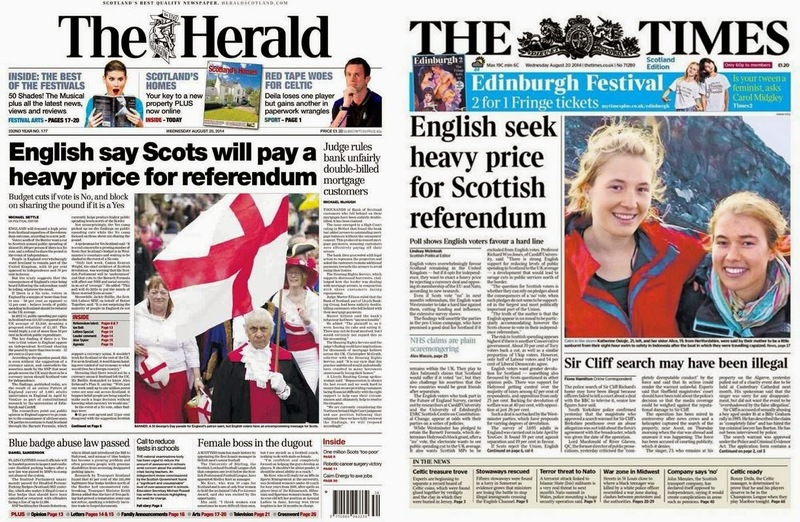 Not only do a majority of my fellow Englishmen want Scotland to vote no to independence because they feel a sense of entitlement to the revenues from Scottish natural resources, they also want Westminster to attempt to severely punish the people of Scotland for their audacity, should they dare vote yes to independence. It seems that the majority of my fellow Englishmen are not very nice bedfellows at all. The fact that most of my countrymen oppose Scottish independence isn't all that much of a problem, after all, everyone is entitled to their opinion. 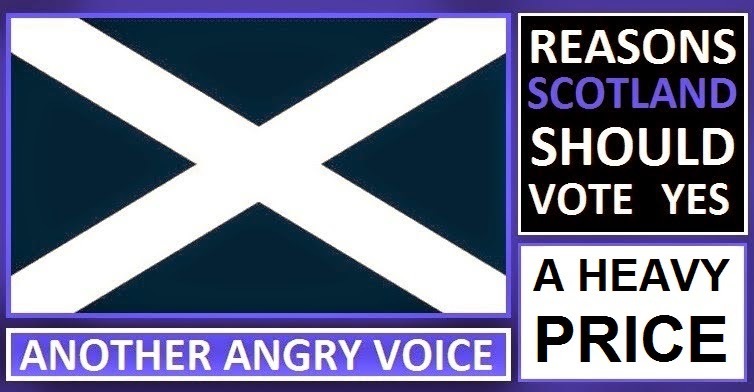 What is completely unacceptable is the ridiculous sense of entitlement that so many English people seem to have towards the proceeds from Scottish natural resources, and the blatantly vindictive "punish them whatever they decide to do" attitudes they hold towards the people of Scotland. All three of the Westminster establishment parties have been offering Scotland "jam tomorrow" promises of more decision making powers for Scotland should the people of Scotland vote no to independence, however the results of this survey show that the English electorate are baying for Scottish blood. It seems extremely likely that any further devolution of powers would also see massive cuts in Scottish public spending, imposed in order to appease the much larger English electorate. The only way for the people of Scotland to ensure that the economic benefits of their abundant natural resources are not redistributed to England is to vote in favour of independence. The majority of my fellow Englishmen want to see the people of Scotland punished whatever they decide to do, and should the Scottish people vote against independence, it's quite clear that it would come at a "heavy price". The results of this survey are an embarrassment to England. They paint us as a selfish, resentful and vindictive bunch with an intense loathing for the Scottish, however I'm proud to be one of the minority of English people who support the idea of Scottish independence, and wish the people of Scotland all the best for the future, no matter what the outcome of the independence referendum. 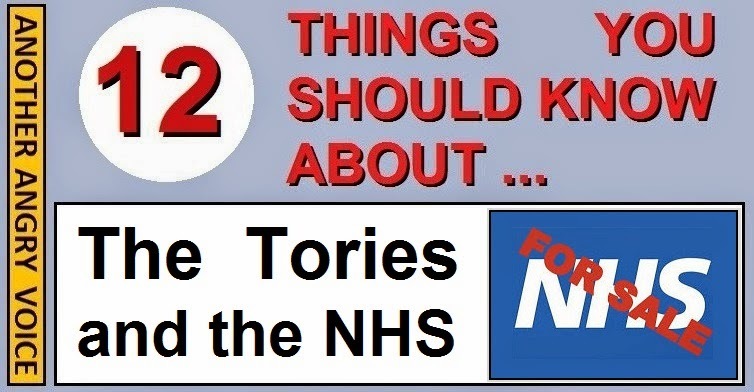 12 things you should know about the Tory NHS "reforms"
In this article I'm going to explain twelve things that you should know about the Tories and the NHS. I have also uploaded a version of this article to Buzzfeed, which contains more pictures but fewer words. You can see that here. Before the 2010 general election David Cameron promised "no more top-down reorganisations of the NHS", then within months of coming to power his Health secretary Andrew Lansley launched the biggest top-down reorganisation in the history of the NHS (the Health and Social Care Act). Cameron also made the pre-election promise that the Tories would "cut the deficit, not the NHS", before launching £20 billion worth of NHS cuts. In 2011 the former Tory leadership candidate Michael Portillo admitted that David Cameron and the Tories had lied to the public about their intentions towards the NHS before the 2010 General Election: "They did not believe they could win an election if they told you what they were going to do because people are so wedded to the NHS." Even though they were facing a Labour party led by an incredibly unpopular and blunder prone leader in Gordon Brown, and in the wake of the biggest economic meltdown in generations, the Tories were still incapable of even winning a majority government. Had they admitted their intentions to carve up the NHS and hand out the pieces to their corporate mates, this would surely have cost them hundreds of thousands of votes, and potentially left Labour to form a coalition government with the Liberal Democrats. Dozens and dozens of the Tory MPs and Lords who voted in favour of the privatisation of the NHS had clear vested financial interests in private health corporations. Here is a detailed list of some of those politicians who look set to benefit from the NHS privatisation bill they voted for. One of the most notable examples is Lazy Lord Coe, who barely ever turns up to vote in the House of Lords (he voted in just 7.9% of debates between 2000 and 2013). However when the opportunity to benefit his numerous private health interests (PruHealth, AMT Sybex, Chime Communications) presented itself, he was amongst many Tory lords with financial interests in the private health sector to make rare appearances in the House of Lords and vote in favour of greater NHS privatisation. Circle Health, which is 29.2% owned by a hedge fund run by major Tory party donor Paul Ruddock has been handed over £1.3 billion in NHS contracts. Other Tory party donors with major investments in Circle Health include Martyn Arbib, Crispin Odey and Michael Platt. Care UK has received over £100 million in NHS contracts. Their chairman is John Nash who has made £247,250 worth of donations to the Tory party. Aside from his company picking up huge NHS contract as a result of Tory party legislation, he has also been handed a seat in the unelected House of Lords. A recent study by the Washington based Commonwealth Fund has shown that the NHS is one of the best, cheapest and most efficient health services in the world, whilst the private sector dominated US health system is the worst, most expensive and least efficient of the eleven different health care systems that they looked at. The NHS reforms introduced by the Tory party are designed to make the NHS much more like the US system by bringing in ever more private health corporations to take over NHS services. The Tory mantra about bringing in the private sector to "make the NHS more efficient" is just a smokescreen. The real reason for bringing in the private sector is to soak as much profit out of the system as possible, with no regards for the quality or efficiency of the service. In 2009 the Tory MP Jeremy Hunt co-authored a book which called for the NHS to be dismantled and called it "no longer relevant". In 2012 David Cameron appointed Jeremy Hunt as Health Secretary, meaning that the man who is now responsible for the NHS is a man who has called for it to be completely abolished. The fact that David Cameron would appoint a Health Secretary who is on record saying that the NHS should be abolished illustrates exactly how gullible he imagined the general public to be when he made the pre-election promise that "the NHS will be safe in my hands". Medical professionals have voted time and again against the Tory NHS reforms. The British Medical Association have also passed motions of no-confidence against the current Health Secretary Jeremy Hunt, and his predecessor Andrew Lansley. Virtually the entire medical profession is opposed to the Tories and their plot to privatise the NHS. It is quite impossible to make the NHS "more efficient" when the people in charge of it are conducting an ideological war against the people who actually run the service. What is needed is people in charge who want to work with the doctors and other medical professionals, rather than against them. The facts that the private sector dominated US health system is hugely expensive and inefficient, whilst the public sector dominated NHS is rated as one of the most efficient in the world should be enough to convince most people that it is a complete myth that the private sector is somehow inherently more efficient than the public sector. When it comes to health care provision it is quite easy to understand why greater private sector involvement causes inefficiencies in the system. If the NHS signs a 30 year PFI contract for a new hospital, or outsources the provision of health care services to a private health company on a 25 year contract, these contracts can only be escaped from at enormous cost in compensation. Even modifying the contracts to take account of changing needs is extraordinarily expensive. When such long term contracts are signed, the NHS is legally obliged to continue paying for them, no matter what the changing health care requirements of the community. These obligations build inflexibility and inefficiency into the system. When the health system operates under a single umbrella, services can be modified with relative ease, but when contracts with hedge funds, private equity groups and multinational healthcare companies have been signed, any modifications incur large financial costs. The Princess Regent University Hospital (which cost £118 million to construct) was built in South London, but under the terms of the PFI contract, the amount repayable over the decades will be £2.5 billion, returning a handsome 70.6% profit to the PFI consortium. The extraordinary costs of paying off this PFI debt crippled the South London Healthcare Trust, forcing them to look for savings. The proposal they came up with was a plan to shut down the Accident and Emergency department and the maternity ward at Lewisham Hospital, and to sell off the land and buildings in order to raise £17 million towards paying their PFI debts. This plan would have left Lewisham (population 750,000) without an A&E or maternity ward, and sparked large public protests and a legal challenge against the decision to shut down most of the hospital and sell off the land. The legal challenge against the closure of Lewisham A&E was successful, but this victory for people power was a short lived one. The response of the Tory party was to pass new legislation to allow the Health Secretary the power to shut down any NHS run hospital, no matter how efficiently the services is run, in just 40 days. As a result, next time a local health authority gets into financial difficulties as a result of their PFI debts, the Tories can simply shut down a load of local NHS run services in order to protect the profits of rip-off PFI consortia, no matter how efficient the NHS services are, or how strong the public opposition. "We will stop the forced closure of A&E and maternity wards, so that people have better access to local services, and give mothers a real choice over where to have their baby, with NHS funding following their decisions." The Tories attempt to force the closure of the A&E and maternity ward at Lewisham Hospital, but were defeated in the courts. The Tories pass new legislation to make it much easier for the Health Secretary force the closure of NHS hospitals and services. "We will make patients’ choices meaningful by putting patients in charge of making decisions about their care, including control of their health records." The Tories table new legislation aimed at allowing private health corporations to buy access to people's private health records without their consent. After a huge public outcry against this plan the Tories were forced to postpone their plan to sell off our medical data. However within a week of them shelving their data sharing plans it was revealed that 47 million private medical records had already been sold off to a private insurance company. The Tories and the NHS eventually admitted that the records shouldn't have been sold off without anyone's consent, so I suppose that's alright then! The most recent example of privatising the profits and socialising the losses can be seen in the botched eye operations carried out at the NHS Musgrove Park hospital in Taunton by the private sector contractor Vanguard Health. 30 of the 60 operations carried out by the private company led to complications, including complete blindness in one case. After just four days the NHS Hospital terminated the contract with Vanguard, but it seems that the NHS hospital will be held liable for compensations to the victims of these botched eye operations carried out on NHS premises by a private company. Another example of the taxpayer having to pay out for the failings of private health companies can be in the case of the Lister Surgicentre in Stevenage, which was run by the private company Clinicenta until the contract was terminated early in 2013 due to poor standards of care. In order to terminate the contract, the taxpayer had to fork out £53 million in compensation to Clinicenta. 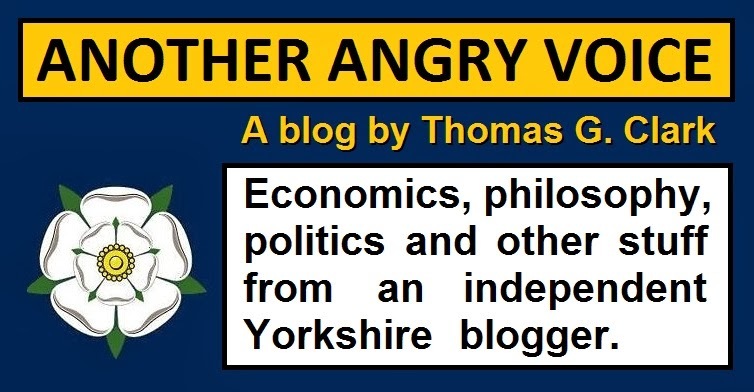 In this article I'm going to set out the case that a Universal Basic Income based welfare system would be a massive improvement on the current punitive welfare bureaucracy in the UK. I've already written a fairly comprehensive article explaining Universal Basic Income, so for the sake of brevity I'm not going to go into masses of detail about it again here, other than to say that it is a form of unconditional welfare payment to which all citizens are entitled. Ideally the UBI payment should be set at a rate which covers the basic costs of living (housing, water, energy, food) meaning that nobody would be forced to live in abject poverty in 21st Century Britain. Those wanting anything more than a frugal and very basic standard of living (stuff like foreign holidays, expensive furniture, new cars, fashionable clothes ...) would have a strong incentive to work in order to pay for their luxuries. One of the main benefits of a universal, unconditional welfare payment would be the removal of virtually all of the costly means testing bureaucracy from the welfare system. Another benefit would be the near complete elimination of welfare fraud, which would free up teams of fraud investigators to go after much bigger fish such as tax-dodgers and organised crime networks. What is wrong with the current welfare system? There are so many flaws in the current welfare system that it would be literally impossible to list them all in a blog post. It was in bad enough shape when New Labour left office in 2010 but after four long years of Iain Duncan Smith's hopeless mismanagement, it is now a humanitarian disaster of bad planning, poor implementation and dehumanising bureaucracy. For the sake of brevity I'll limit myself to detailing just four of the worst aspects of the current welfare system, and how the introduction of UBI would represent a significant improvement. One of the biggest problems with the current welfare system is the way in which it creates strong disincentives to work through the removal of benefits. In many cases benefits are removed at such a rate that people find themselves even worse off if they decide to work. Many hundreds of thousands of people have found themselves receiving desultory increases in income (often less than £1 per hour worked) because of the way that benefits are removed almost as fast as additional income is earned, or have even found themselves economically worse off for having found a job. At best, the additional income through finding work is desultory, at worst finding a job actually costs people a share of the pittance they were surviving on. Few would argue that these factors are not strong disincentives to work. Iain Duncan Smith's catastrophically botched Universal Credit scheme was supposedly designed to eliminate these appalling disincentive to work, but research by the Joseph Rowntree Foundation found that it actually does no such thing. Should Universal Credit even survive Iain Duncan Smith's incompetent management, many people would still be financially worse off should they decide to increase the number of hours they work under the Universal Credit system. Even though Iain Duncan Smith and the DWP relentlessly talk up their Universal Credit scheme as the biggest welfare reform in decades, it's absolutely clear that it is actually nothing more than hugely expensive tinkering with an already dysfunctional system. 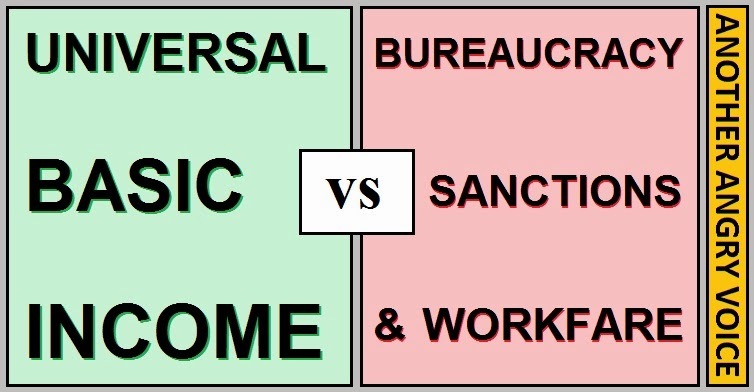 The introduction of a system based on Universal Basic Income would neatly resolve the disincentive to work problem because if the public are always entitled to their basic unconditional income, paid work would always result in a notable increase in individual income, since the individual would be earning their salary, on top of their unconditional basic income payment. The problem that the disincentive to work problem presents to the establishment order is that it is extremely difficult to tackle long-term unemployment when work doesn't pay, or results in nothing more than a desultory increase in overall income. The fact that people can't be positively encouraged into work with the "carrot" of increased income means that the only motivational tool left for the state to use is the "stick" of rendering people absolutely destitute through arbitrarily applied sanctions if they won't comply with DWP demands. Nearly a million people were left destitute by DWP benefits sanctions in 2013. The widespread use of benefits sanctions is a humanitarian catastrophe, and I'm not exaggerating with hyperbolic language either. Very many people have died during their benefits sanction period (most often the mentally disabled and severely ill). In many cases people were still fighting appeals against arbitrary DWP sanctions until the day they died from their illnesses, in many other cases people committed suicide or even starved to death. Iain Duncan Smith and the DWP have repeatedly lied that there are no such things as sanctions targets and sanctions league tables, however sanctions targets and the official DWP sanctions league tables were both leaked to the press in 2013. Sanctions targets and league tables are particularly vile things because it is blatantly much easier for DWP staff under enormous pressure to meet their monthly sanctions quotas by tricking the mentally disabled and uneducated into violating DWP rules, than it is to expend a great deal of effort in catching out the minority of committed benefits "scroungers", who often understand the DWP rules better than the staff themselves. Under Universal Basic Income this kind of deliberate impoverishment by the state simply couldn't happen because everyone would be entitled to an unconditional subsistance income. This would mean that the pressure on DWP staff to trick vulnerable people into making mistakes in order to fulfill their sanctions quotas would be completely eliminated. The power of the state to use absolute destitution as a social weapon against the public would be completely removed by virtue of the fact that the public would have an unconditional right to their subsistence income. There are two main problems with the idea that all welfare payments must be means tested. The first is the costly burden of bureaucracy that this approach loads onto the system. The current welfare system employs tens of thousands of people to means test welfare payments, welfare recipients are made to waste countless hours filling out forms with the same personal information and collecting supporting evidence over and again, and the whole system costs countless £billions to administer. The second problem with means tested benefits is the way in which they are perceived by the public. When a benefit is universal, very few people strongly oppose it because everyone is entitled to it. Take the provision of universal healthcare through the NHS as an example. 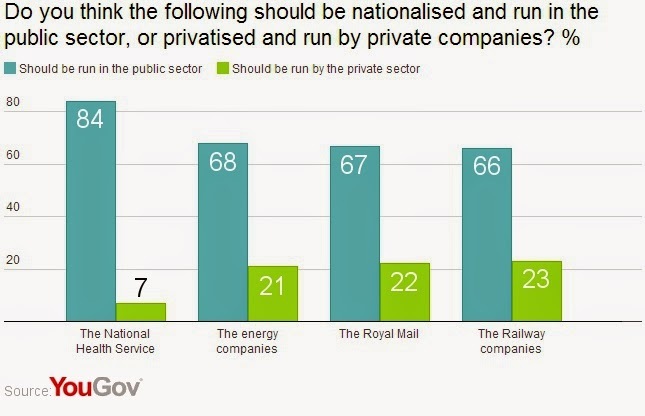 The NHS has very strong public support, with just 7% of the public favouring NHS privatisation (not that this remarkable level of public support has stopped the Tories from carving up the NHS and giving it away to their donors). If the state decided to bring in new rules to means test health provision (lets say anyone earning over £20,000 per year would have to pay compulsory medical insurance and/or pay for their medical services) there would almost certainly be a large decline in the level of public support for the NHS. It's much easier to convince people that welfare provision is a very good thing if they are entitled to a share of it. If they get the idea that they are paying for it, but that they are barred from receiving any of the benefit, it's easy to understand how strong feelings of resentment would arise. The introduction of Universal Basic Income would resolve both of these problems. The bureaucratic costs of administering the system would be massively reduced if the vast majority of people received a standard UBI payment. Of course administrative costs cannot be completely eliminated from any system, however, the lower the cost of administration, the higher the share of the budget that actually ends up where it should be - with welfare recipients. UBI would ensure that a much higher proportion of the welfare budget actually gets paid out to the public, rather than being wasted on the administrative costs of endless means testing. The introduction of UBI would also assuage public resentment at the cost of the welfare system. The fact that everyone would be entitled to UBI would mean that nobody would be left thinking "why should I have to pay for this when I get no direct benefit from it". In recent years there has been an ever accelerating drive to bring in private outsourcing companies (A4e, Atos, Serco, Capita, G4S, Pertemps, Seetec ...) to carry out the administrative functions of the welfare system. This process was not started by the Tories (New Labour were the ones who introduced the discriminatory Atos WCA assessment regime for the disabled for example), however, under Iain Duncan Smith's "leadership" the DWP has brought in ever more private outsourcing companies into the welfare system on vast £multi-million contracts. Some of the most shocking examples include, the expansion of the notoriously inaccurate Atos WCA regime, the hopelessly underperforming Work Programme and their "Help to Work" forced labour scheme. Many of these parasitical outsourcing companies make near enough 100% of their revenues from government contracts, and the contracts are so badly written and one-sided that it really doesn't matter how badly these outsourcing company perform, they suffer no financial penalties, they still get paid and they still get awarded even more government contracts despite their appalling track records of failure. The problem is so serious that even companies like G4S that have carried out vast frauds against the taxpayer still end up being handed more £multi-million contracts, even though they were supposedly barred from bidding for government contracts during the tendering process. Another example of a corporate outsourcing parasite that has been caught out defrauding the taxpayer is A4e. This is a company which made 100% of its revenues from government contracts at the time its director Emma Harrison decided to award herself an £8.6 million dividend. Given that all of the companies revenues are generated through the taxpayer funded "welfare to work" system, it's easy to see how this vast dividend represents nothing more than skimming off a percentage of the welfare budget to fund the lifestyle of a very wealthy individual. The introduction of a system based on Universal Basic Income would eliminate the possibility of corporate outsourcing parasites skimming the welfare budget and diverting money that should be helping the most vulnerable people in society into their corporate accounts. With the massively reduced bureaucracy, and the end of sanctions backed forced labour schemes that UBI would bring about, the scope for corporate parasitism of the welfare system would be severely reduced. Of course there would still be a role for private companies looking to profit from helping people into work, but they'd have to help people train for and find the kind of work they want, rather than just hoovering up government subsidies in return for forcing them onto unpaid forced labour schemes under the threat of absolute destitution via benefits sanctions. The current system was bad enough before the Tories even came to power, but after four long years of Iain Duncan Smith's maniacal blundering it's in the most appalling shape it's ever been in (and many would argue deliberately so). Iain Duncan Smith's tenure at the DWP has been little but a dreadfully prolonged systemic failure. I'm not trying to say that Universal Basic Income is some kind of wonderful panacea. It wouldn't cure all of the problems in society in one simple step. There are no such things as magic bullets. What I have tried to demonstrate is that the principle of UBI could make the foundations of a much better welfare system than the current shambles. I believe that a person would have to be delusional to argue the case that the current welfare system is well designed, well managed and efficient, therefore most sensible people would accept that there are grounds for improvement. In my view you can either support the near identical prescriptions of the Westminster establishment parties (tinkering with the broken system) or you can support a completely new approach, be it based on Universal Basic Income, or some other fundamental reform to the system. I suppose it comes down to this. If you are naturally a right-wing authoritarian who believes that the state has a right/duty to use the threat of absolute destitution as a social weapon against the public to force them into paid or unpaid work, you're probably quite happy with the way things are done right now. If however you believe that the state has no right to force people, including tens of thousands of children, into absolute poverty simply because a family member committed "welfare crimes" such as being five minutes late to an appointment, selling remembrance poppies, attending a job interview or even suffering a heart attack during an interview, then Universal Basic Income represents an elegant solution to the problem. If every citizen has a right to an unconditional subsistence income, then the state would no longer have the ability to use the threat of poverty/hunger/cold/homelessness as a social weapon.